Why Feed the Hogs when all you want to do is feed your DEER! Double "D" BIG BUCK Gravity Feeder! 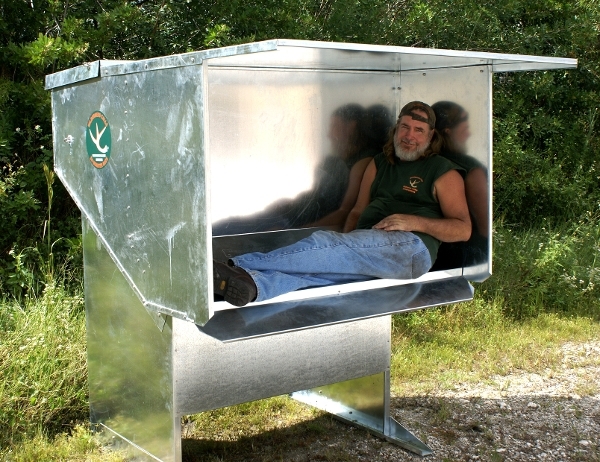 Take better care of your deer herd with the Double "D" Big Buck Gravity Deer Feeder. 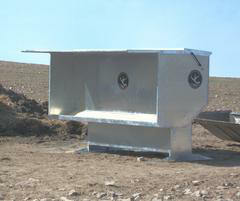 Product Information: The feeders seen below are constructed with 16 gauge steel and have no welds. 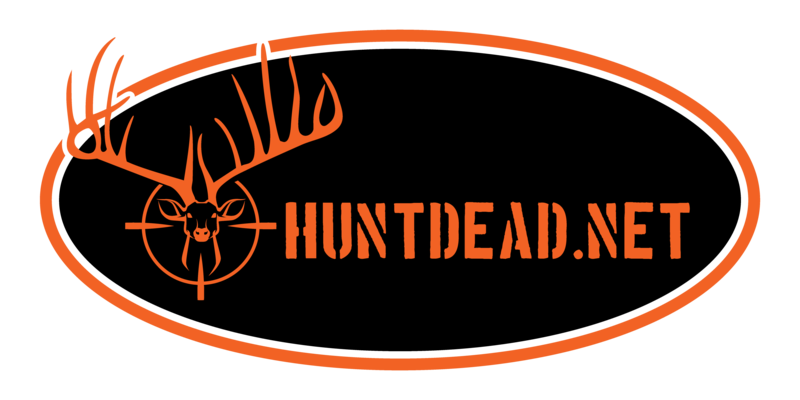 This helps eliminate the chance of rust which makes the deer feeders last longer. 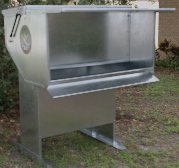 This gravity deer feeding system also helps prevent the loss of feed to other animals, such as hogs. Ordinary feeders spread the feed on the ground, but the gravity deer feeders seen below keeps your feed in the feeding tray which is 35" above ground. 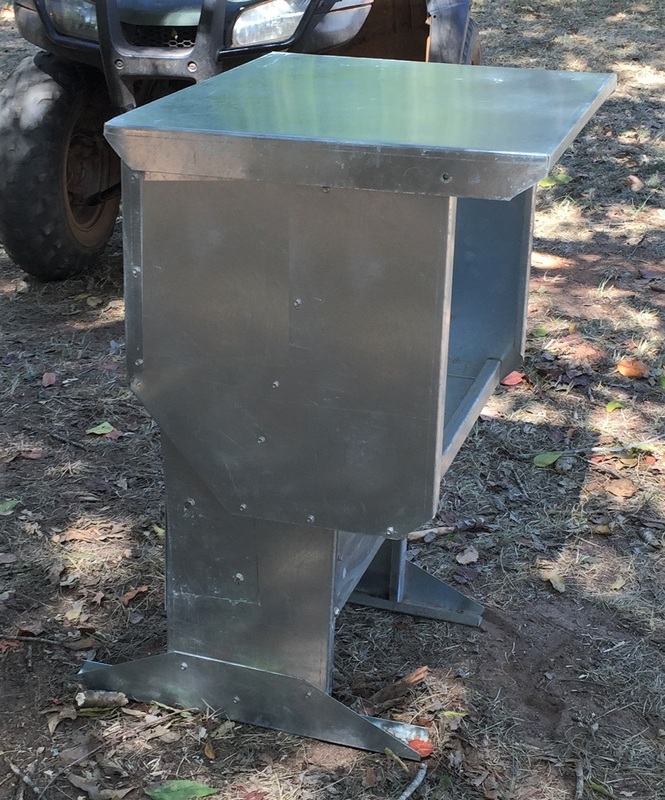 The deer feed drops down into the tray as it is consumed and these feeders have the capacity to hold from 200 pounds up to 1200 pounds of feed (depending on the model below). "Patent # 8,418,651" The Double "D" Fawn gravity deer feeder is just another addition to the quality feeders produced at Wilderness Calls. 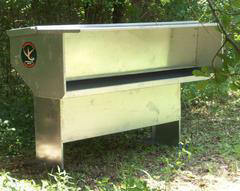 The Fawn Feeder stands 18 inch off the ground and is two feet in width. 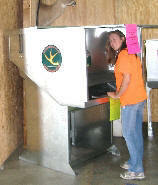 It is constructed from the same America made galvanized steel as the other Double "D" gravity deer feeders. It has a load capacity of approximate 60 lbs. Great for starting the little fawns on hard feed, that is healthy for them and will accelerate the growing process. 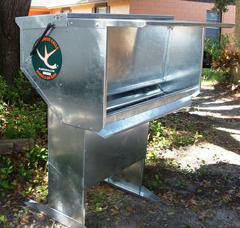 The Fawn feeder can also be used for other small animals, ie; goats, dogs, exc. "Patent # 8,418,651" 16 gage galvanized steel--Stainless steel bolts and screws--Load capacity 200 pounds--8" trough--35' from ground to trough--Total height 4 feet 5 inches--22" from trough to lid--9" clearance from front of trough to front of feeder--Weight is approximately 230 pounds empty. "Patent # 8,418,651" 16 gage galvanized steel--Stainless steel bolts and screws--Load capacity 300 pounds--12" trough--35" from ground to trough--Total height 4 feet 10 inches--22" from trough to lid--13" clearance from front of trough to front of feeder--Weight is approximately 275 pounds empty. "Patent # 8,418,651" 16 gage galvanized steel--Stainless steel bolts and screws--Load capacity 700 pounds--12" trough--35' from ground to trough--Total height 4 feet 10 inches--25" from trough to lid--13" clearance from front of trough to front of feeder--Weight is approximately 500 pounds empty. 8' wide to allow more deer to feed at one time 8' wide to allow more deer to feed at one time. "Patent # 8,418,651" 16 gage galvanized steel--Stainless steel bolts and screws--Load capacity 1,200 pounds--12" trough-- available 19 " or 35' from ground to trough--Total height 6 or 7 feet--39" from trough to lid--12" clearance from front of trough to front of feeder--Weight is approximately 700 pounds empty-total width is 8 feet. Following the close of the sale, we will need a contact phone number and email address so that we can work with you to secure the best shipping rate on the unit. Shipping is always less if we ship the item to a business address versus residential address.